These cheesecakes are just the right serving for such a deliciously rich dessert. The Merlot Strawberry topping is a unexpected twist on the classic cheesecake that is sure to please any guests. They can be make up to 2 days ahead, making them a perfect dessert for any party. *Only use the full-fat cream cheese or else the cheesecake will not turn out properly. To create the crust, mix the Graham Crumbs and butter in a large bowl. Graham crumbs should be just damp and slight stick together. Line each cup of the muffin tin with a cupcake liner. Place approximately 2 tbs of the mixture in each cup. Using your fingers or the back of a spoon, compress the graham crumb mixture until firm. Place in the oven to bake for about 5 mins. Remove from oven and set aside. For the topping, beat one package of cream cheese with an electric mixer, affixed with the paddle attachment, until soft in a large bowl. Once soft, add 1/3 of the sugar and the cornstarch together on low until creamy. Alternate adding additional cream cheese with sugar, scraping the bowl after each time. Add the vanilla. Blend in the eggs, one at a time, beating well after each. Ensure to scrape the bowl frequently during the whole mixing process. Beat in the cream until just blended. The filling should be light and creamy. Divide the batter evenly between all the cupcakes, filling each one almost to the top of the cupcake liner. Bake for 15-18 mins or until the centre barely jiggles. Set aside and let cool. Meanwhile, start the topping. In a medium saucepan combine the strawberries, sugar and Merlot over medium heat. Simmer until strawberries are thawed and sugar is melted. In a small bowl, combine the water and cornstarch. Stir until the cornstarch is dissolved. Add the cornstarch to the strawberry mixture and stir over medium heat until the mixture is thickened and no longer retains a “creamy” look. Remove from heat and let cool. 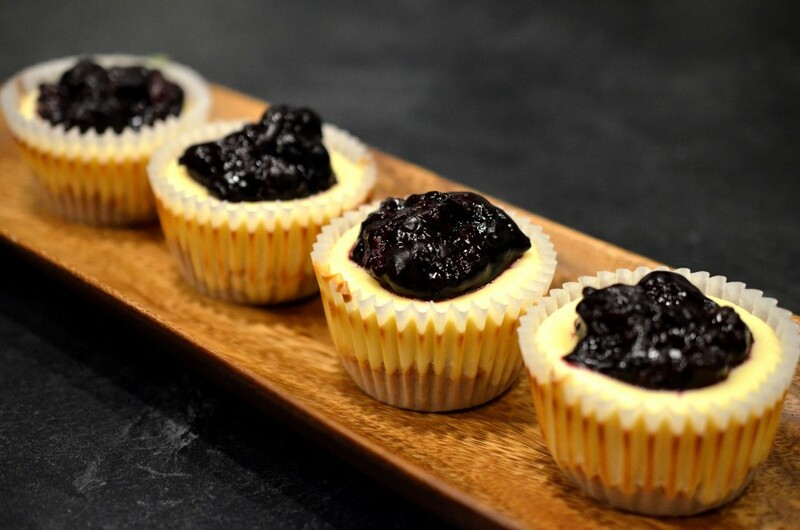 Once all ingredients are cool, place about 1 tbs of topping on each of the mini-cheesecakes. Place in the refrigerator until ready to serve. These can be made up to 2 days ahead.